Have you ever seen a book with a secret hollowed out space inside. 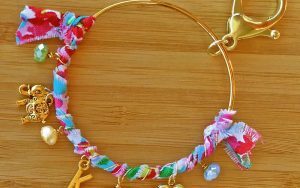 We always thought that idea was super fun! So we decided to hollow out a book and turn it into a jewelry box! We got a hardback book at the thrift store. We picked one that was 1½” thick so the space inside would be deep enough. Then we used a craft knife to hollow out the inside. Here’s a video showing how we did it. We also have step by step instructions below. Let us know if you make one! 1. 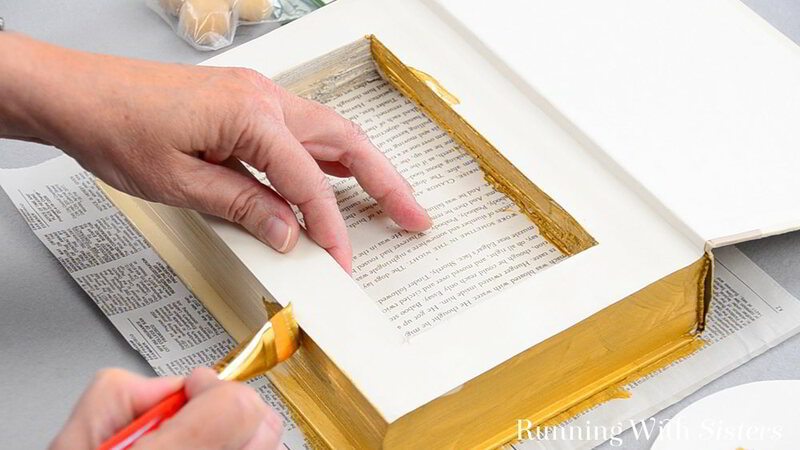 Before you cut the secret opening inside the book, paint the outside pages of the book with Mod Podge. This glues the pages together. 2. 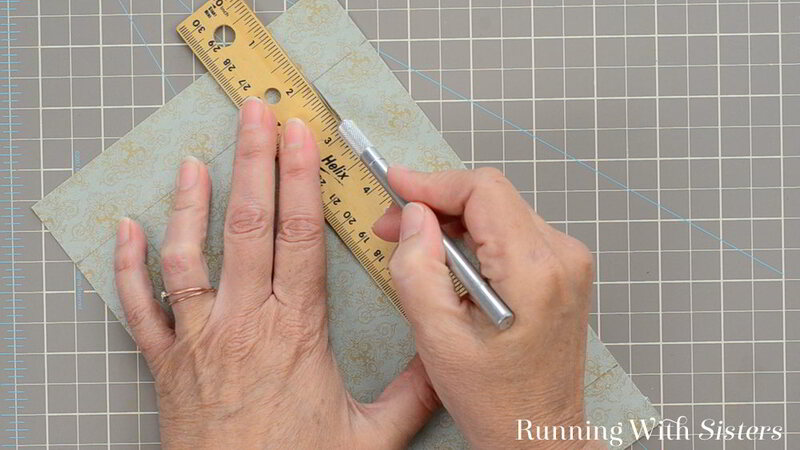 To cut the opening inside the book, make guidelines using the ruler and pencil. 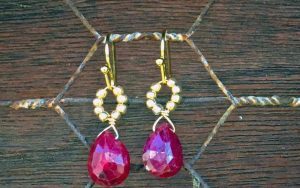 We recommend a rectangular opening about 1″ from each side. 3. 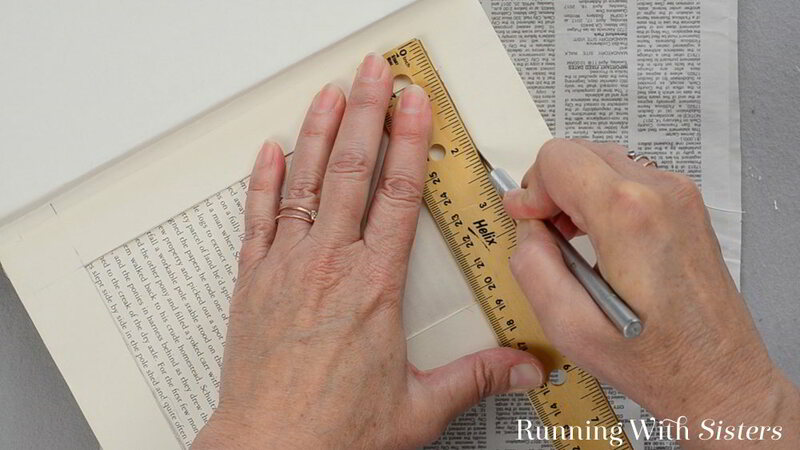 Use the X-acto knife and a ruler to cut through the first ten of the book. Please be careful! 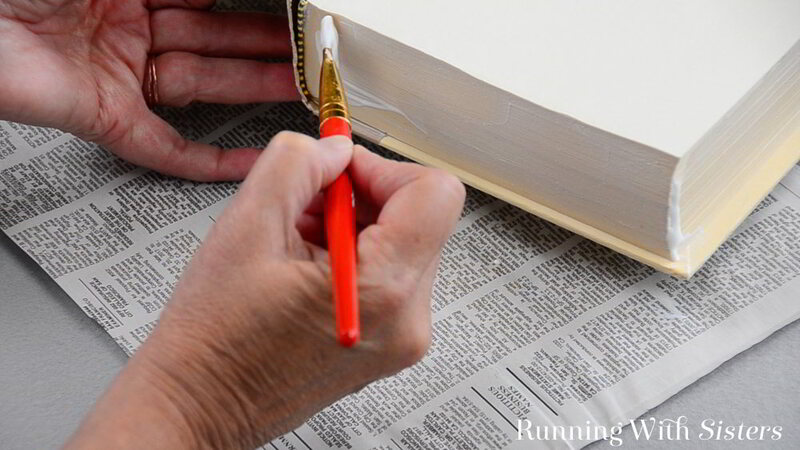 Take your time and make repeated cuts, rather than trying to cut through all the pages at once. Continue to remove ten or so pages at a time until you have an opening inside the book that is almost as deep as the book. 4. 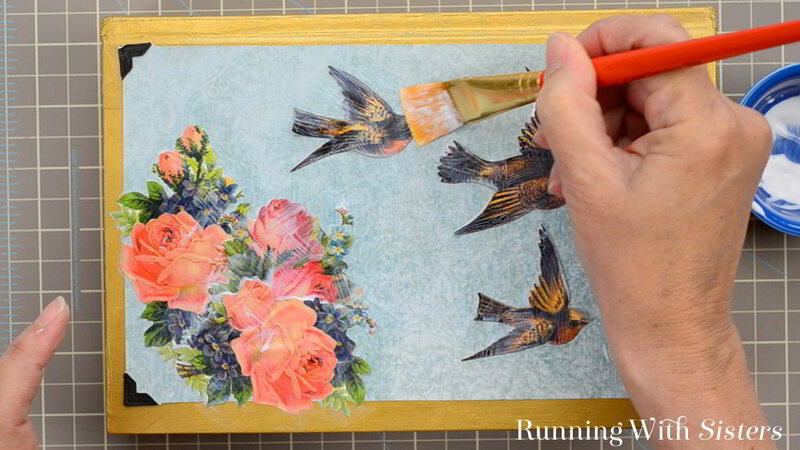 Paint the inside of the opening with Mod Podge. 5. 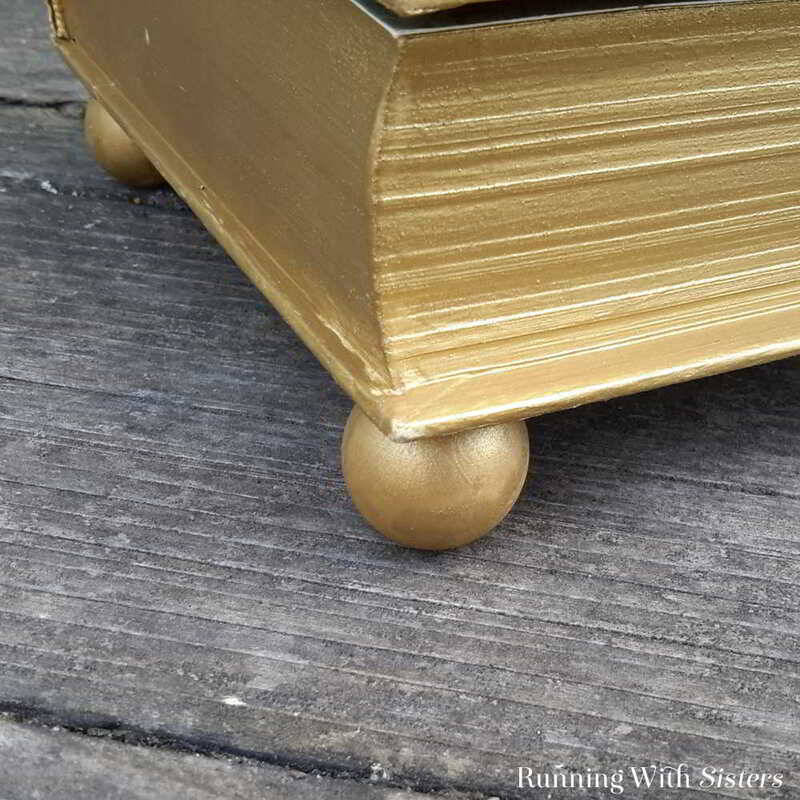 To decorate the book and turn it into a jewelry box, paint the outside edges of the pages, the cover, and inside the opening with the gold paint. 6. Cut a piece of decorative scrapbook paper to fit the inside the opening and to cover the first page. Mark the size of the opening on the paper. Cut it out with the craft knife. 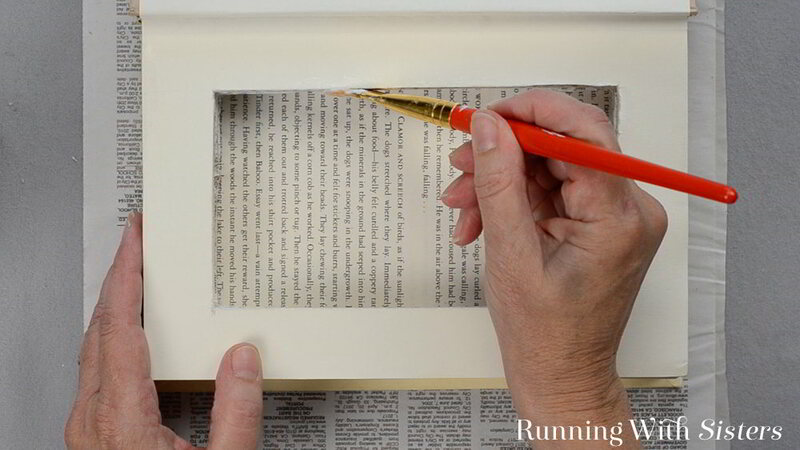 Glue the decorative paper into the bottom of the opening using the Mod Podge. Glue the rest of the decorative paper to the inside front page. 7. Decorate the cover of the hollowed out book using more scrapbook paper and clip art. Cut a rectangle of scrapbook paper slightly smaller than the lid. Coat the back of the page with Mod Podge and glue it to the cover. Glue photo corners on each corner of the paper piece using Mod Podge. 8. 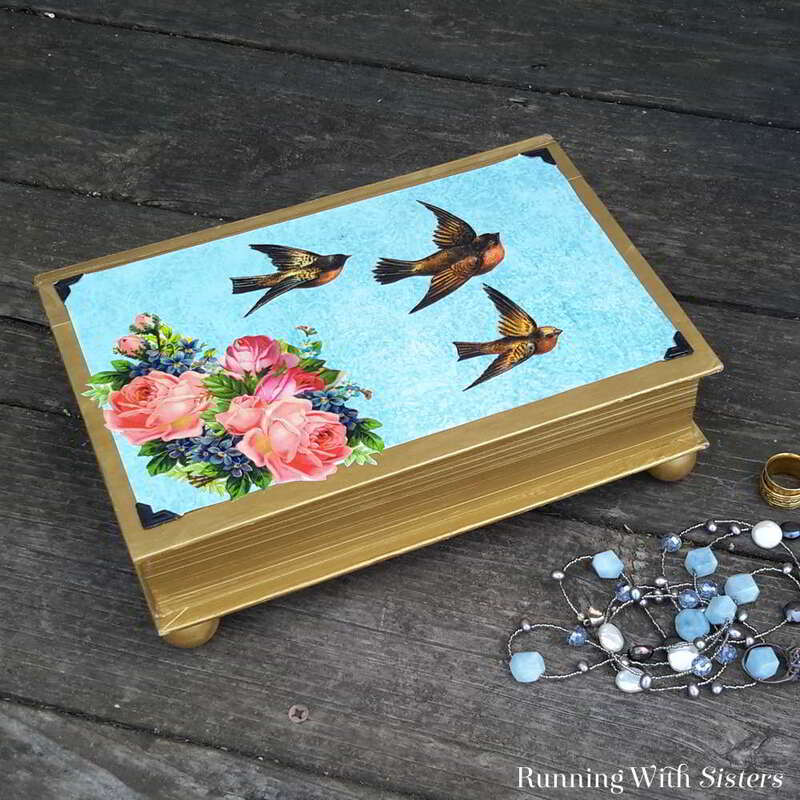 Cut out the clip art and decoupage them onto the lid with the Mod Podge. 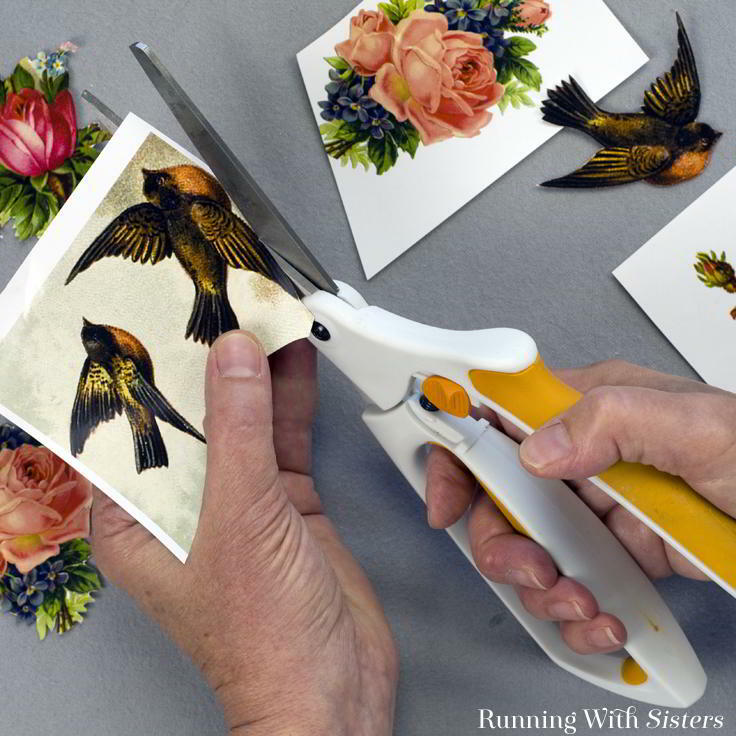 To do this, coat the back of each piece of clip art with Mod Podge and press it down. Then paint a coat of Mod Podge over the top. Finally coat the entire lid with a layer of Mod Podge. 9. 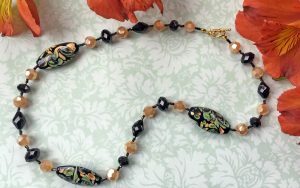 Paint 4 wooden beads with the gold paint. 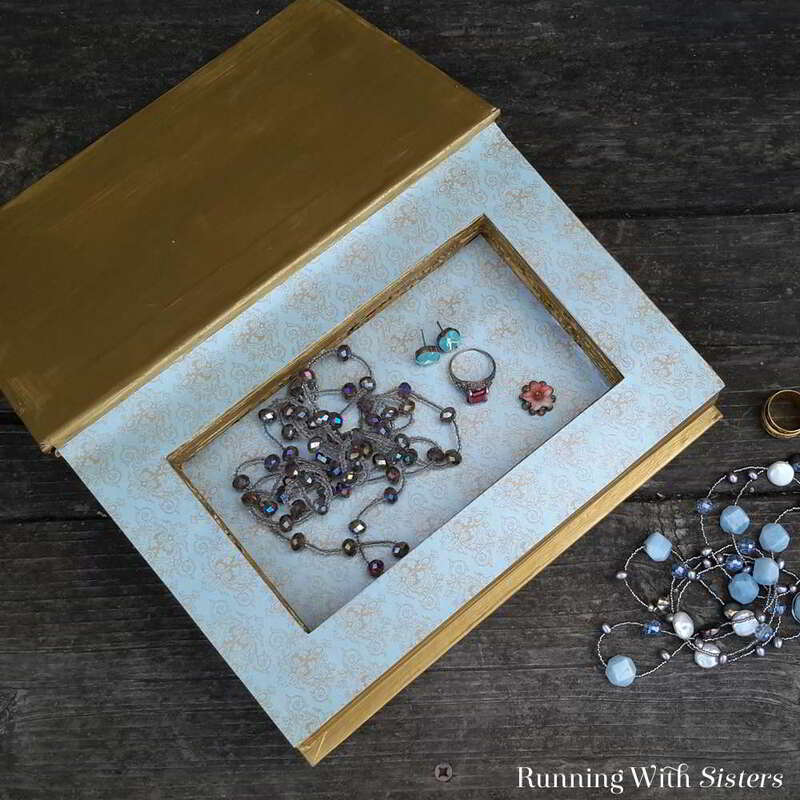 To give the jewlery box “bun feet,” glue the beads to the bottom of the book box with E6000. 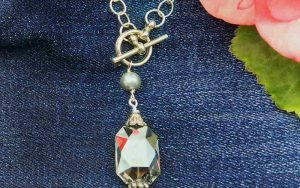 Here’s a fun review of this how-to project. Yes, Kylie from Take On Adventure took the time the follow our instructions and report on them. Thank you!! Here’s the review with a few wonderful additional tips. We hope you have fun with this project. And remember if you have any questions, just leave us a comment and we’ll reply. We’re here to help! We love it when you pin our projects! 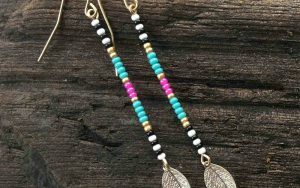 Hover over the picture below to see the Pinterest pin button.